Home » cinema reviews • drama • text reviews » Are you Lonely Tonight, Mister? It’s been at least a month since I saw Harmony Korine’s latest film, Mister Lonely, and I can’t get it out of my head. It’s an odd, poetic, surprising work, and yet it still manages to be easily Korine’s most accessible film to date. It feels more structured than his previous two films, Gummo and Julien Donkey-Boy (he also wrote Kids when he was 19), and demonstrates an increase in maturity. Watching the film was a strange experience for me, and writing about it proves rather difficult (as practically ever review I’ve read makes pains to point out). The plot, which isn’t necessarily the focal point, is in two pieces, with neither explicitly intersecting the other. 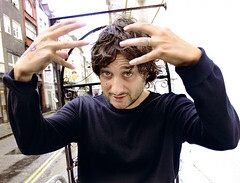 There are definite tonal connections, however, and I suspect Korine would rather have the audience draw their own connections than force them to accept whatever connections he sees. The primary story revolves around a Spanish Michael Jackson impersonator living in Paris, though knowing little of the language. He meets a Marilyn Monroe impersonator, played by the always fantastic Samantha Morton, who convinces him to move to a sort of hippy commune inhabited solely by impersonators. She’s married to Charlie Chaplin, and their daughter is Shirley Temple. The commune is also home to the Pope, James Dean, Madonna, Sammy Davis, Jr., and a rather short-tempered Abraham Lincoln, among others. The other story involves a group of skydiving nuns. I guess I have to elaborate on that a bit. 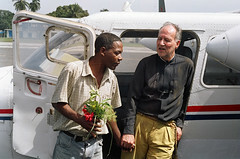 Basically, the story is that the nuns, and a priest played by Korine’s hero, Werner Herzog (the filmmaker perhaps best known now for his recent documentary Grizzly Man) are flying over some poor villages and dropping food packages when one nun falls out of the plane. She miraculously survives, and the others see it as a miracle, and an opportunity for them to take part in a test of faith. Ultimately, this is a film that will probably only appeal to a small segment of the film-going public, but those who do enjoy it will find it to be unlike anything they’ve ever seen: obtuse and accessible, melancholic and joyful, arty and plain, beautiful and ugly. There were slow, meandering shots, dreamlike montages, bits of old hymns, and surreal humor (a rant from Honest Abe while he spun a basketball on his finger had me in stitches). You’ll probably wind up scratching your head, but trust me, there’s some real meat in there if you let yourself stew on it for a while.